This tabouleh was inspired by my recent essay 'A Chance Encounter with Ed Hyder's Mediterranean Marketplace' post. 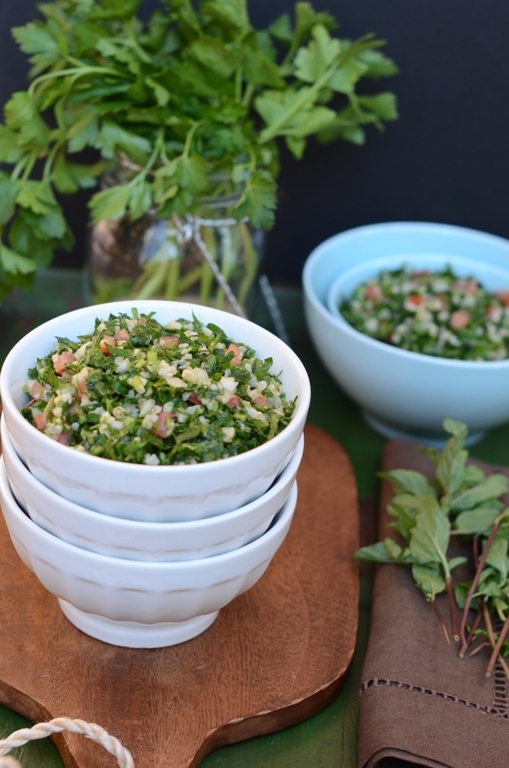 I have made tabouleh plenty of times in the past, but never from a recipe. For the purpose of this post, I had to backtrack and come up with one. 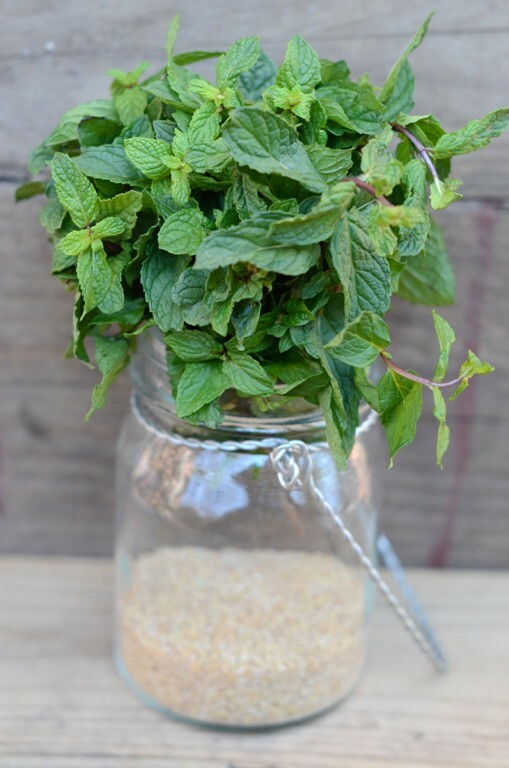 I usually add the basic ingredients and adjust lemon, mint leaves and salt for flavor as I go. I adjust oil as I go for consistency's sake. I have different quirks, I call them quirks, but they are sound advice that I think help achieve the best tabouleh. Tip #1 Herbs: First and foremost I wouldn't process the herbs in a food processor. The blade will bruise them. I like to finely chop them with a sharp knife. As I chop, I try to roll them gently,the best I can, and slice them, as if you are rolling basil leaves for chiffonade. Though this is my number one advice, let's backtrack. Tip #2 Herbs: I like to wash the herbs and spin them in a salad spinner. I like my my herbs dry so excess water won't muddle the vinaigrette. Tip #3 Herbs: I like the thicker bottom stems of the parsley removed. The upper stems of the parsley leaves are on the tender side and edible. 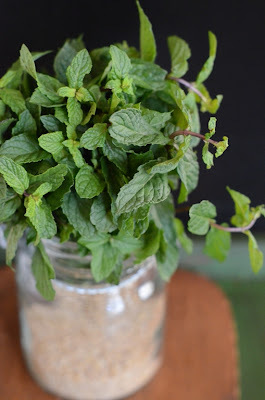 With the mint I only use the leaves, I find the mint stems to be tough and unpleasant to the palette. It's easier to chiffonade the mint leaves like basil without the stems. Tip #4: I like to keep the salad minus the tomatoes over night in the refrigerator to soften and marinate before serving. You could easily make salad ahead even two days in advance. Tip #5 Herbs: I normally do not like giving measurements for herbs. If I give it in cups, is it tightly packed or lightly packed? Who will measure the rate of pressure one person applies vs another per packed cup?! Do you see the photo below titled storm? That was one bunch parsley. I used two of those. Yes, a very large bunch. Also, do you see the mint sprigs to the right in the photo below? I used leaves from 6 of those sprigs. I did succumb and added approximate cup measurements. 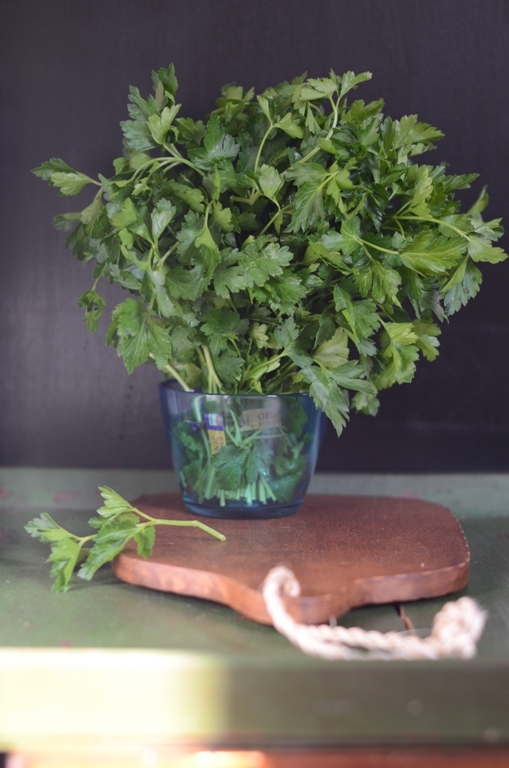 Tip #6 Herbs: I also like to use flat leaf Italian parsley vs curly. I haven't used curly parsley in decades. It is my personal preference. I will be darned, but not only do I not like the shape and texture of curly, but I also am convinced it tastes different than Italian parsley.While we are on the subject of shapes and textures I dislike, I also dislike fusili, but that is a separate post. Bulgur wheat ﻿﻿is considered whole grain by the USDA and is parboiled and dried, unlike cracked wheat that is a crushed raw grain. 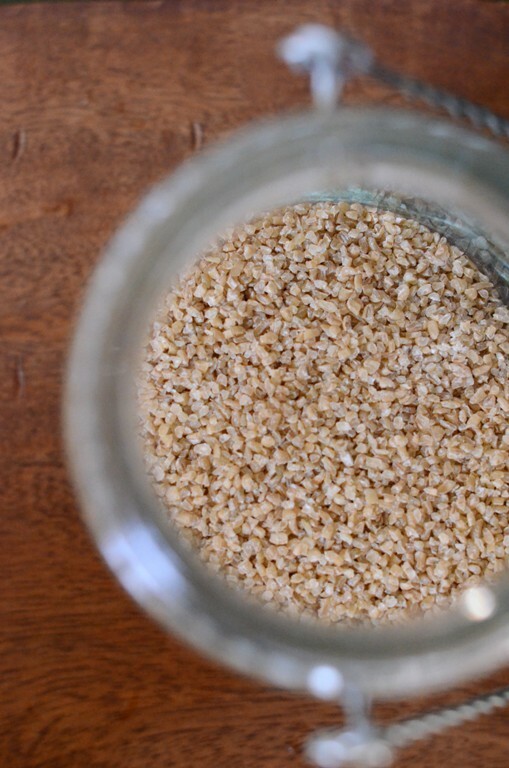 Most bulgur wheat is made of durum wheat, though most in the US are from white wheat. It also has different size grinds/granulations, fine #1, medium #2, coarse #3 and extra coarse #4. 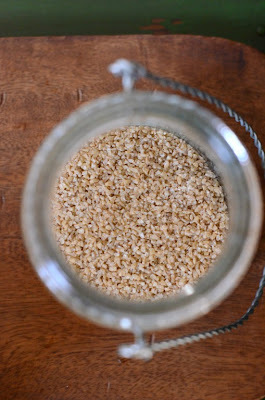 Often in the store you will find pre packaged bulgur wheat also labeled as cracked wheat. It is very confusing as cracked wheat isn't parboiled. I buy it at the bulk section and medium granulation is best suited for making tabouleh. Bulgur is high in protein and dietary fibers. Widely popular in Middle Eastern cuisines, it is a main ingredient in kibbeh and tabouleh among other dishes. In Turkish and Armenian cuisines you will find a red tabouleh made with tomato paste or sauce. The tabouleh origin is in Lebanon and Syria. Tip#1 Tomatoes: I like to use Roma tomatoes in my tabouleh. They keep their shape well when diced. You most certainly can use any you any type of tomato you have at home. Tip #2 Tomatoes: do not seed the tomatoes, the seeds will help moisten and soften the parsley further. Though Romas do not have an enormous amount of seeds, I like the touch of added moisture from the tomatoes. Tip #3 Tomatoes: I like to add the tomatoes just before serving. I find wilted day old refrigerated tomatoes unappetizing in any salad. Tip #1 Lemons: I like freshly squeezed lemons. I find store bought lemon juice has a more concentrated taste to it even if it is not concentrated. If you use store bought, start with 1/2 the amount called for in this recipe and adjust from there. Place bulgur wheat in a medium bowl and pour boiling water over it. Cover with saran wrap and let sit for 20-30 minutes for the water to be absorbed, while working on assembling the rest of the ingredients. Add parsley, mint, onion, lemon, oil and salt and mix well. Check if bulgur wheat is puffed and ready. It has a chewy texture when ready, drain from excess water and add to parsley and mix. Let sit in the fridge overnight or two. Add diced tomatoes before serving, mix and enjoy!! I think people tend to hold back on the amount of lemon juice... but I always add extra because it gives it the zing this dish needs. This looks fabulous, Shulie! Thank you. Yep B. People are shy about adding lemon. I saw other recipes with only 50% of the lemon juice I added. I find it gives it a faint lemony flavor but the 1/2 cup gives it the authentic zing it needs,:)Its acidity also helps soften the parsley. I love to make tabbouleh in summer, when the herbs in my garden are abundant, and I can pick herbs and tomatoes right outside the kitchen door. Unfortunately, I'll have to wait about 8 months for that! I vowed to have my vegetable garden back this summer. Though I find in DC area the herbs and lettuce taste best grown in Spring and Fall. In the Summer they get a bitter edge to them. Luckily we got in the area organic green houses that grown them year round. This is by far one of my favorite salads ever, my Mom makes it almost once a week when I'm home! And like you said, we rarely make it with a recipe, adding a little of this and that. We don't normally add mint (although traditional), but mix it up with cilantro! I bet with mint it would be great! Must make this for M soon! Gorgeous pics as well dear! TY so much Miss Rebecca!! hat is something I really love! Your bulgur looks wonderful. One of my favorite lunches! Looks wonderful. Thx Terra. Yep. Even three days...unless you flood the salad with oil which no one wishes to do. Technically you could eat the bottom stems to but they are a tad tougher. Happy you found this post useful my friend! Looks so refreshing and delicious. And such a lovely combination of flavors. I made my first tabouleh last summer...recipe from Ina Garten. It was way too salty, so I need to try again. Thanks for all the excellent tips...I will definitely use your recipe for the most traditional taste. Thanks, Shulie! One of my favorite salads! I love that it has all that wonderful parsley, so good for you! 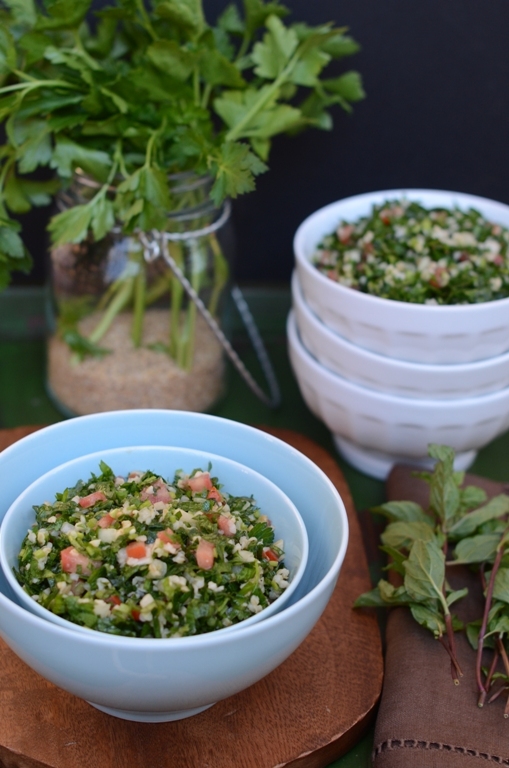 Love how refreshing, light and health tabouleh is! I know, right?! I don't know why I didn't make it in awhile?! Another of my favorite things and I was very carefully reading through the tips. I think I do the same...only change amounts as per mood and need of the parsley. And I do make the Turkish one (kisir) more often as I like the tomato and the pepper paste in it. Spiced up. I could eat T. day after day w/out getting bored. oh yeah .. i too don;t like curly parsley leaves that much and the mint stem , absolutely NO NO. This dish looks lovely and greats tips you shared out here. TY Kankana! :) Maybe, just maybe I would consider curly as a garnish as mentioned below:). As always, I love your pictures, Shulie. Beautiful. 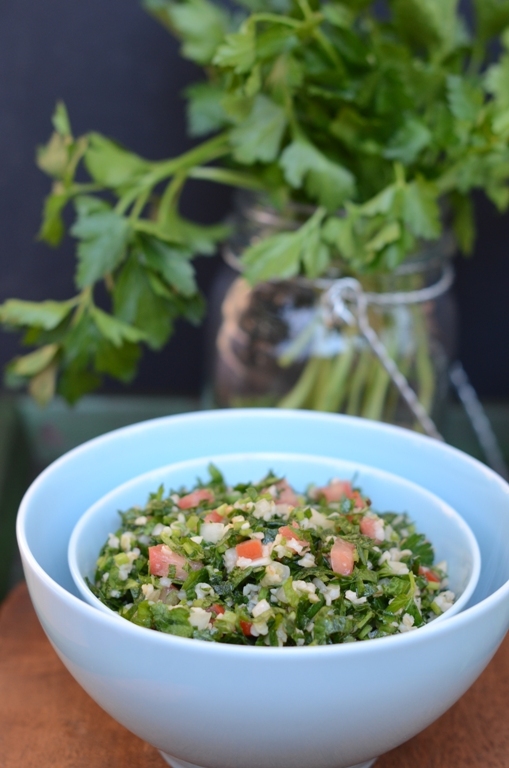 I've had tabbouleh so many times, but I have never made it at home. Don't ask me why:) I think curly parsley is great as a garnish, along with curly kale, but for flavor I also prefer Italian parsley - in Serbia, that's the only kind we had. BTW, I just returned from visiting my daughter at Berkeley, still brimming with pride:) How is your son doing? Enjoyed your post very much. I share your taste on Italian parsley and I too add tomatoes to salad at last minute. Why do you use mild instead of EVOO? Thanks, Shulie, very interesting. I learned to make tabbouleh from a Lebanese woman, and she put in a lot of green onion, and so I like the very fruity kinds of EVOO to balance the onion as well as the generous amount of lemon juice. But I have some mild EVOO too and I will try the salad your way. Such a healthy, delicious dish is certainly worth making often. Very interesting version. Will give tabouleh a slightly different flavor profile. I need to track down the history behind tabouleh with regular onions vs green onions. All the Lebanese people I know raise an eyebrow when I quiz them about tabouleh with green onions. My personal preference is with regular onions but I can see how you would wish to balance the green onions with a more fruity EVOO. Fascinating indeed! Gorgeous looking & sounding tabouleh! Restaurant worthy! I'm guilty of not enough lemon I think. We make tabbouleh fairly often because we're dip crazy at about 5pm. I'm going to try your recipe and see how it goes. This is so beautiful Shulie! I would add a little bit of extra lemon too! Thanks for sharing all those great tips! Gorgeous recipe and thanks for the handy tips! thanks for your lovely sharing. our websites are 徵信. and 台南室內設計.